Image caption Author Marcelo Rubens Paiva says that "justice is a word without meaning in Brazil"
In the years after Marcelo Rubens Paiva's father, Rubens Paiva, was tortured and killed under Brazil's military dictatorship, his family resolved to be strong in public. "Photographers wanted to take pictures of us sad, so we started a battle against the media," he said, speaking at the Flip literary festival in the town of Paraty, in Rio state. "The family of Rubens Paiva does not cry in front of the cameras." With these words, he broke down in tears. The 1971 disappearance and death of Rubens Paiva has taken on a new significance for his son this year. Aged 55, he has recently become a father himself for the first time. He says it made him think about what it would be like for his son to grow up without a father. "It's the first time that I cried," he said, after taking part in a session to discuss the 50th anniversary of the military coup that deposed President Joao Goulart and which resulted in the disappearance of his father. Marcelo says that the events of the 1964-1985 dictatorship remain as poignant and relevant in Brazil today as they were 50 years ago. His father was one of more than 450 people to be killed or disappeared during that period. Rubens Paiva - a congressman with the Brazilian Labour Party (PTB) - was arrested in Rio de Janeiro along with his wife Eunice and daughter Eliana over suspected links to guerrilla leader Carlos Lamarca, one of the most high profile opponents of the dictatorship. Eliana was released after a day while Eunice was held for 13 days in isolation. According to the army, armed guerrillas sprang Mr Paiva from jail two days after his arrest - a version of events the family has never believed. It was not until last year that Brazil's National Truth Commission, which is investigating past abuses, heard evidence that Mr Paiva had been tortured and killed. Earlier this year, the commission heard evidence that his body had been dumped in a river. Marcelo has described his disappearance and the confirmation so many years later of what happened to his father a "double torture". According to Marcelo, not that much has changed in Brazil since the end of the dictatorship. In his 1982 autobiographical novel Feliz Ano Velho (Happy Old Year), Marcelo wrote that "justice is a word without meaning in Brazil". He says the scale of injustice in the country remains the same 29 years after democracy was restored. As an example he cites the case of Amarildo de Souza, who disappeared after being questioned by police in a Rio favela last year. Prosecutors believe Mr Souza was tortured and killed in a police station and have charged 25 officers in connection with the case. Marcelo argues the similarities between his father's fate and that of Amarildo are strikingly similar. 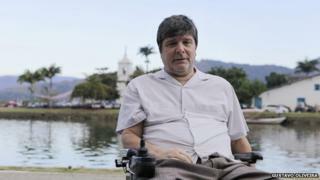 "He had four kids, he was taken out of his home without any kind of accusation, tortured with electric shocks, disappeared in the night," he says of Mr de Souza who lived not far from the area from which his father Rubens was snatched and disappeared. For Marcelo, part of the problem lies with Brazil's failure to confront its past. "We forgot our history, we just look to the front, we have so many problems but we just turn the page, look to the future." The award-winning writer and playwright insists that the same institutions that produced injustices during the dictatorship remain in place today. Marcelo says that even though in the last two decades Brazil has been led by three presidents who were themselves persecuted, arrested and imprisoned by the military regime, the army still denies they ever tortured anyone inside their installations. "They're supposed to be the owner, the chief, the commander of the army and they can't break this line between the truth and the past," he says. But it is not all bleak for Marcelo. In Feliz Ano Velho he wrote: "But they will never kill that hope we have of a better world". Thirty-two years on from writing his debut novel, that hope is still with him. He says he has been heartened by the creation in 2012 of the National Truth Commission, which investigates human rights abuses during the dictatorship. "We are living in an interesting moment, these two years; many things have changed. "I still have hope that we are able to do some justice," he says. And with October's presidential election fast approaching, there is potential for more change. Marcelo says he has no idea which party his father would support if he were alive today. This year, an audio recording of one of Rubens Paiva's speeches was rediscovered. In the speech, delivered on the eve of the coup, the Congressman calls on the population to offer resistance and defend President Goulart and his government. "My father was a very open-minded guy," Marcelo explains. "He knew everybody from the left and from the right. He was a nationalist." Marcelo, like his father is a firm believer in democracy. But he fears that if one party dominates the polls, it can lead to stagnation. "I believe one of the fundamentals of a democracy is the process, and years of one party in power is dangerous. "I prefer a country that could have a circulation of power among other groups. I hope that we can change."